Summer matters as research shows that children born into poverty are likely to suffer a 6,000 hour learning gap compared to their middle school peers. This learning gap isn’t from a lack of classroom learning, but rather from the lack of access to greater world learning through a lack of preschool, summer camps, after school activities, family reading time, and day trips. Here’s our top 10 ways we’re showing SUMMER MATTERS! Because Summer Matters our middle and high school students have been busy coding, drawing, writing, performing, programming, sharing, and learning a ton! Because Summer Matters we built partnerships with YouMake, Big Brothers-Big Sisters, Children’s Bereavement Center, Project YouTurn, and Augmented Intelligence Academy to make all this learning possible! Because Summer Matters we’re building up the literacy learning for all students each day, offering intensive courses for our most struggling readers, and a Kindergarten readiness program in partnership with Florida International University. Because Summer Matters we keep our children’s minds busy as they take part in visual arts, enrichment sessions, computer time, structured free choice. Because Summer Matters we keep our children’s bodies busy too as they take part in daily fitness. Because Summer Matters we share God’s love through Devo Time every day with fun songs, games, and skits. Because Summer Matters we go on weekly field trips engage, enrich, and open new learning to our children. Because Summer Matters we engage high school youth as interns in our summer programming building leadership skills with hands-on learning through internships. Because Summer Matters we challenge our students to give back. West Homestead Site youth traveled to Daytona to support the children’s summer programming at Central Baptist and our Overtown Site youth take part in weekly community service projects around Miami. Because Summer Matters we invite teams from across the country to come share in the summer fun as they bring new learning and experiences to our children at both sites. Thank you to all our great summer teams this year! Summer matters to each and every child, youth, and adult we serve through our programs this summer. We hope the great things happening at Touching Miami with Love matter to you too! 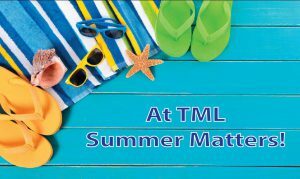 Help support our summer programming through your summer gift to TML. Just go to https://touchingmiamiwithlove.org/give/ with your gift of $10 or more. Summer is almost over, so don’t wait to show that Summer Matters!